Admit it: the latest Beetle isn't so bad looking anymore. Volkswagen&apos;s latest Beetle has been on the scene barely a minute and already tuners are taking it to town. 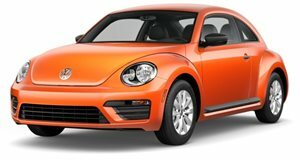 The tune jobs for the newest Beetle speak volumes to how much Volkswagen has changed the image of the Beetle since its last incarnation. The Bug is no longer a girly car meant to be driven by Barbies. It&apos;s now meant to be a budget Porsche with a slim and sleek figure with an optional engine that&apos;s bursting with potential. It&apos;s quite obvious that VW wants to shed its girly image forever. Germany&apos;s B&B Automobiltechnik created three power stages for the Beetle&apos;s 1.4 TSI engine and four power stages for the Beetle&apos;s 2.0 TSI. The top-of-the line package pushes the Beetle&apos;s overall horsepower to 320 and 310-lb ft of torque. B&B Automobiltechnik Bug can top out an impressive 155mph and do 0 to 60 in 5.6 seconds. German Tuning company JE Design has created a new suspension and body kit for the 1.4 TSI Beetle and reserved the under-the-hood stuff for the Beetle Turbo and its 2.0 TSI. The new ECU for the Turbo pushes the Beetle&apos;s power from 200hp and 207lb-ft of torque to 240hp and 229lb-ft. The top-end JE Design Bug can do 0 to 60 in 6.9 and top out at 143. What you&apos;re looking at is the first tune job of the newest Beetle. VWvortex created this souped-up bug with a little help from Photoshop and their readers. The result is a Halloween-esque bug that sits on 19 inch Porsche GT3RS replicas and features a Forge Motor Sport carbon dual intake system. ABT Sportsline&apos;s "Speedle" features a new body kit with everything from new front headlights to side skirts. The Speedle sits on 19-inch-wheels. Each engine variation sees a significant jump in horses, with the 1.4 TSI leading the way with a jump from 160hp to 210hp. The 1.2 TSI goes from 105hp to 140hp and the 2.0 TSI sees a marginal increase from 200hp to 210hp.